When it comes to game time recipes, my husband and I couldn't be further apart on the spectrum of things that we enjoy eating. I love creamy dishes; he is a big fan of traditional veggie and tomato-based dishes. Thankfully, we are both fans of chili stew. This Taco Chicken Veggie Stew is a variation on the traditional chili, full of hearty vegetables and a spicy chicken. To begin, saute the white onion, garlic, diced carrots, and Rotel tomatoes in the bottom of a stock pot over medium to medium high heat. Once the carrots are firm but tender, add in the remaining ingredients, except for the green onion. 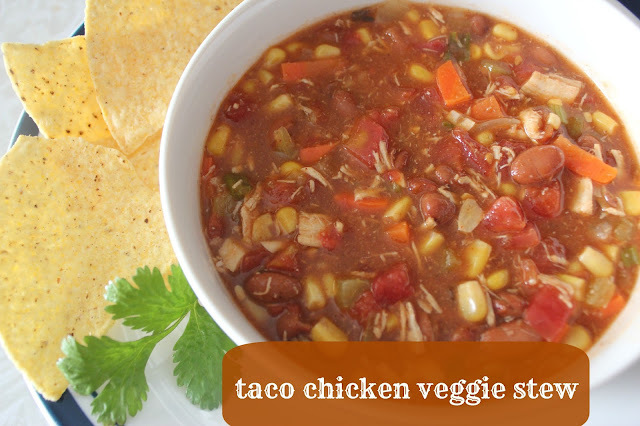 This is a colorful and hearty dish that is low in fat and will please the chili fans and the veggie soup fans. Use low-fat sour cream and cheese to cut even more calories!